Northwestern Ultimate’s Jeff Holm (#11) throws to Theo Bisdikian (#58) during a game earlier this season. The team is headed to Nationals for the first time ever later this month. 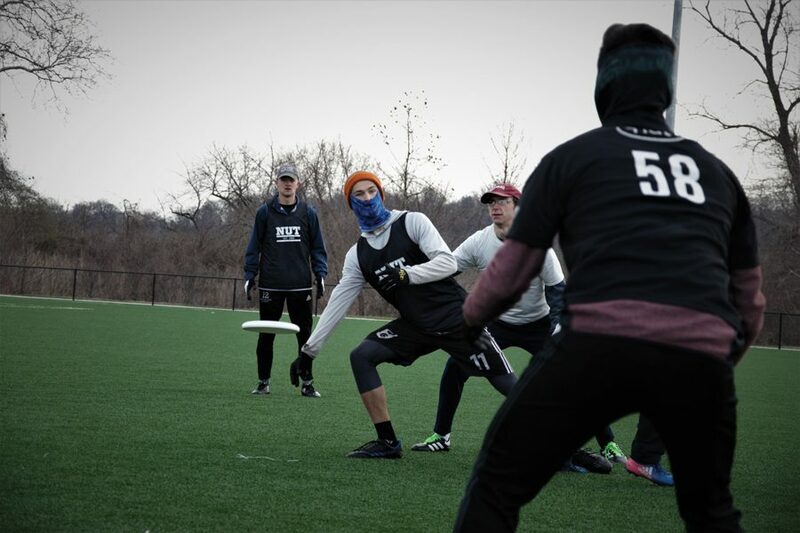 Many an athlete stresses the cliche of taking each week, or each game, or each possession, one at a time — but few take the mentality as seriously as Northwestern’s club ultimate frisbee team. So when the team, which goes by the abbreviation NUT, made a defensive stop and quick transition goal in the 2018 Great Lakes Regionals final on April 29, the players were simply happy to get another point. Then, pandemonium erupted. In reality, the 15-13 victory over Notre Dame had actually put NUT through to the USA Ultimate Men’s Division I Nationals for the first time in the program’s roughly 28-year history. The team will now compete as one of the top 20 teams in the country at the national tournament on May 25-28. In ultimate, points are scored by catching a pass in the end zone; players cannot move while holding the frisbee. Teams are expected to score on most possessions and defensive stops are considered break points, similar to tennis. First-year graduate student and NUT member Chris Rozolis is very familiar with tennis: He played for 13 years. After he joined Northwestern’s ultimate team five years ago, however, the strangest aspect was not adjusting to the new type of break point but rather to NUT’s unique strategy of deliberately staying ignorant of the score. The unique strategy seems to work. After playing regular season tournaments this winter and spring in numerous distant states, including Florida and Texas, NUT downed Michigan State and Grand Valley State in the pool play portion of the regional tournament. That advanced the team to the quarterfinals, where it avenged a result in the same stage last year against Purdue before upsetting the University of Chicago in the semifinals and then topping Notre Dame later that day. They battled to a 13-13 tie before Keith Bohrer’s fifth goal of the game and a quick transition goal following the defensive hold gave NUT the championship. The Regionals title snapped a streak of three consecutive years falling in the quarterfinals, marking the first major triumph achieved by Yngve’s unconventional tactics and overcoming an odd real-life atmosphere of unscripted dramatic irony. This past fall, after a large portion of last year’s team had graduated, NUT called up a number of players from their “B-team” and projected 2018 to be a rebuilding year, Valdillez said. But the team quickly exceeded expectations. One tournament the team competed in was played on fields with scoreboards, a major threat to NUT’s prevailing strategy. So the team continually replaced the scores with zeros until the tournament director forced them to stop, Valdillez said. They won’t be able to tamper with the scoreboards quite as easily at Nationals, which will take place a short drive north in Milwaukee. “That’ll throw us off,” Valdillez said with a laugh. NUT isn’t going in explicitly seeking a championship, though — in fitting fashion, they’re instead just hoping for a solid qualitative performance against a field featuring teams ranging from William & Mary to Washington.